You are here: Home / How To Change Your Life / Is It Time To Discover How Gratitude Could Change Your Life? Is It Time To Discover How Gratitude Could Change Your Life? … would you use it? 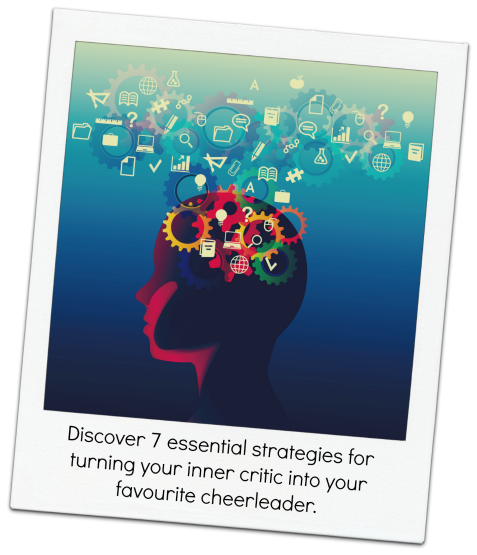 … and easily training your brain to think of happy thoughts and be your favourite virtual cheerleader. … and finding that you have become a magnet for synchronicity and things ‘falling into place’, right when you most need it. … and instead feeling energised, vibrantly alive and full of open-hearted joy, consciously creating the life you were born to live. …And discovering that all of this (and much, much more) is not only possible, but easy, when you know how! … And watch the miracles unfold in your life! If you feel like you have been there, done it and tried pretty much everything, but it somehow still hasn’t worked for you, then don’t despair! That’s why I’m here. Chances are that the missing key was gratitude. But there’s more to it than simply developing the cliched ‘Attitude Of Gratitude’ and hoping it will change your life. What’s usually missing is the ‘how’ and the ‘habit’. And without that, where do you start? And how on earth do you get results? These insider secrets are exactly what I’ll be sharing with you in our upcoming Gratitude Inner Circle Programme – and much, much more! I’ll be teaching you, step by step, the practical strategies and expert techniques that it took me decades to discover and create, so you can become a master of them in the next 90 days. I have been there and done it – and got a wardrobe-full of the proverbial t-shirts. I haven’t led a charmed life and I’m by no means a ‘Pollyanna’. I have been through tough times – just like you. I have been through everything from a marriage break-up and being a single mum with 2 kids under 3, to having nowhere to live, to not knowing how I was going to pay the next bill, to losing my dream home, to being ripped off by someone I trusted (5 figures! ), to multiple miscarriages, to losing people I loved, to feeling like my world was falling apart and spending years indulging my inner Drama Queen to the extent that I was heading at top speed on a short-cut towards self-destruct. Like you, I felt stressed, overwhelmed, exhausted and, frankly, totally stuck. Nothing I tried (and I tried every course, book, seminar and programme I could find) seemed to help for more than a few days or weeks. And then I realised a vital truth that suddenly set me free from all that and turned the light back on at the end of the tunnel (and it’s such an important Truth that I’ll be sharing it with you in the ‘Getting Started’ section of this programme). And I came out the other side. With a smile on my face and gratitude in my heart. By using the exact techniques that I’m going to be sharing with you as part of this Gratitude Inner Circle programme. Basically, this stuff works. I have used it myself and I have helped countless others to discover the miracle of gratitude, too. In fact, whenever times get tough, gratitude is always the key to getting back on track – and I use these techniques daily. 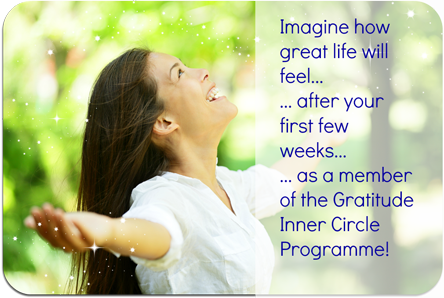 And I know, deep in my heart, that this Gratitude Inner Circle Programme can help you to change your life, too. 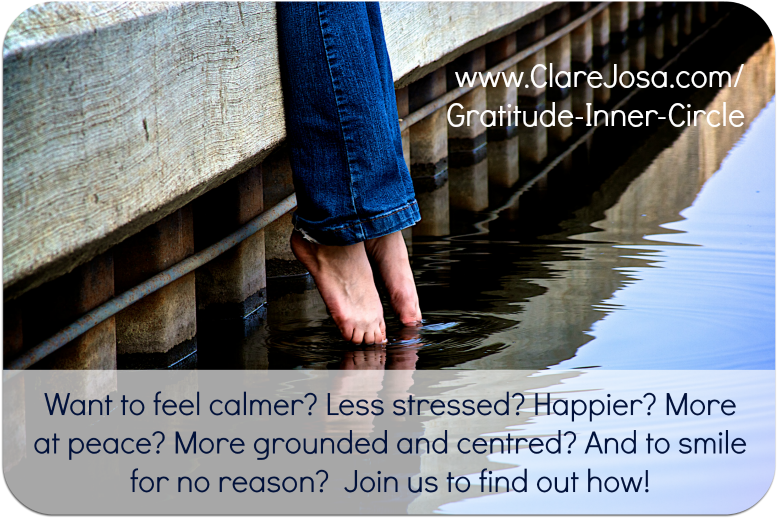 What Is The ‘Gratitude Inner Circle’ Programme? It’s a 3 month Group Mentoring Programme, which runs online, rather than face-to-face. It brings you similar benefits to working with me one-to-one, but in the comfort of your own home, at a time that suits you, with the added benefit of moral support from the Inner Circle’s private online community – and all at a fraction of the cost, yet still getting brilliant results. Each week you get a new module, with a core theme. There’s a weekly workbook, a video, affirmations, life-changing exercises, a fortnightly yoga sequence, to help you deal with physical and energetic blocks, visualisation and meditation MP3s, discussions in the private online community, to help you really integrate the learnings, and a live fortnightly Q&A Masterclass. By working through this as an Inner Circle programme, you’ll cover the equivalent material that would have taken us a full year of one-to-one mentoring, in just 3 months – at a fraction of the cost. I have used my decade+ of experience as a certified NLP Trainer and Meditation Teacher, as well as the practical common sense that comes with being a reformed Mechanical Engineer and busy mum of 3 young boys, to break the strategies down into quick-to-learn, easy-to-apply bite-sized chunks, so that you can be part of this amazing journey, no matter how busy your life is. And it works at so many levels, helping you to change just by working through the modules – it becomes a new and easy habit – you don’t have to remember dozens of ‘how-to-checklists’ or complicated procedures! The shifts you’ve been dreaming of will happen for you, live, as we’re working through the material – just as they would in a one-to-one personal mentoring programme. Gratitude is one of the sweet shortcuts to finding peace of mind and happiness inside. Expect to spend about 5-10 minutes a day, reading the emails and sometimes dipping into the forum. Some of the projects take a minute or two. Others might be ten minutes a day, for that week – it’s up to you. If you miss a day, that’s fine, just pick up where you left off, or catch up. It doesn’t take long. And I have specially designed things to allow you to be flexible and to help make it easy for you to find time to join in. What matters is consistency – regular efforts to let this life-changing programme work for you, even if it’s just 3 minutes a day. Uncover the unconscious habits that keep us stuck in pain, fear, stress and worry – and exactly how to use gratitude as the perfect antidote. 7 little-known secrets to tame your inner critic, once and for all. Discover sixty-second strategies to help you rebalance your life, so you can find more time, with less stress, get more done and even carve out time to do what you most love doing. Learn how to handle even the most challenging situations – and how to easily turn things around with one simple ‘magic’ question. Put an end to feeling jealous or inadequate, loving all that you are and have in your life and knowing that there’s plenty more where that came from. Feel less stressed, more productive, be able to concentrate more easily, feel more at peace and less irritable. Feel more confident at work and at home – even in situations that you used to find difficult. Be one of the few who knows the most potent time and way to practise gratitude, which can ramp up its effectiveness by at least 1000% – and why not knowing this could cause your unconscious mind to accidentally undo all of your hard work. 4 concrete strategies you can apply in just minutes, which will transform your relationships – even with those really difficult people! 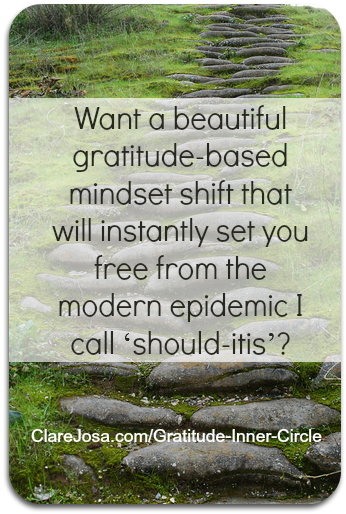 A beautiful gratitude-based mindset shift that will instantly set you free from the modern epidemic I call ‘should-itis’. 3 essential tweaks that are usually overlooked, which turn gratitude from being a baggage-laden effort into being a heart-opening life-transformer. Experience for yourself how becoming a conscious consumer and a generous giver can release the blocks that were keeping you stuck, helping you to take your life to the next level. Be able to easily handle emotional situations, feeling calmer, happier, more centred and more peaceful, throughout your day. Get clear about where you want to go in life – and who you want to be – and learn 6 essential tools for releasing your out-dated limiting beliefs, fears and excuses, which would otherwise have stopped you from ever getting there. I’ll let you in on my personal secret strategy for allowing what you have been dreaming of to arrive in your life, without having to force or push or beg or plead – or give up! Gently open your heart to love and to allowing yourself to inspire others to do the same. The happiest people you’ll ever meet aren’t the ones who have everything; they’re the ones who exude gratitude for everything they have, with each breath and thought. Warning: This programme (‘program’ for my USA friends 🙂 ) is not for you if you are still living in a space where you believe that life ‘happens to you’ and is totally beyond control – or if you believe that other people are responsible for your happiness – or if you don’t want to take responsibility for choosing how to live your life – or if you’re addicted to being the victim – or if you’re looking for a zero-effort quick-fix solution that will change your life for you, without you having to do anything. You’ll know if your heart is calling you on this. You’ll be starting to feel the excitement, bubbling away inside you, as you sense that Gratitude has been waiting for you; that it’s the ‘missing link’; that it’s your next logical – or intuitive – step. Those ready for this Gratitude Inner Circle programme are easy to recognise. – something bigger; something wonderful. – to take things to the next level. – and to your future self – to put in the effort to apply these life-changing gratitude-based techniques, to make life-long shifts. If your heart is calling you to go deeper, then I invite you to dive in today and get started. Not having enough time is the #1 truly legitimate reason excuse (sorry! I have used it often enough, too 🙂 ) I hear from people about why they can’t change their lives. Firstly, we tackle this, head-on, in the ‘Getting Started’ section and in the first module, and I’ll guide you through exactly how to find the time and the moral support you need to love this Gratitude Inner Circle programme. Secondly, do you really think that the ‘future you’ on your 80th birthday will look back and say “Hell yeah! I’m so glad you didn’t bother changing your life because the ironing / TV / Facebook / mowing the lawn was so much more important!”??? Or do you think that ‘future you’ might wish you had taken action today that could help you to feel happier and more fulfilled, for every day of the rest of your life? … to guide you through this Inner Circle programme and to inspire your day and help keep you on track. … to help you create the shifts you’re looking for – taking you step by step, week by week, through the life-changing effects of gratitude practices. There are specially designed to build on each other, helping you to create firm foundations for a life lived from the heart, not the head. … I’ll be sharing the insider secrets and shortcuts that have taken me decades to discover, to help you make the progress you’re looking for – fast. … mindfulness practices, worksheets, MP3s and videos, for those times when you want to go the extra few steps and deepen your experience. They are only available to members of the Gratitude Inner Circle. … Specially-designed meditation and visualisation audios, and fortnightly yoga videos, to help you melt away your gratitude blocks and integrate the weekly projects, at a deep level, easily! 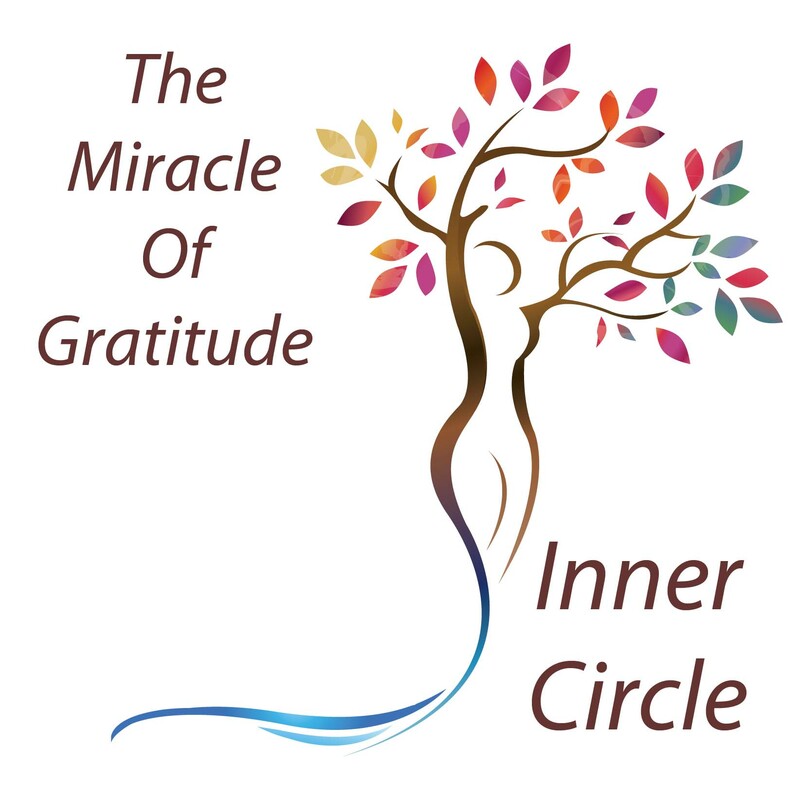 … exclusive to Inner Circle members – get answers to your gratitude questions and have a chance to get one-to-one mentoring with me, live on these group calls. Note: these are the only live calls I’m doing at the moment. … a members-only area where you can share your experiences during this Gratitude Inner Circle – totally private and certainly not as public as Facebook! Connect with others in the Inner Circle and talk about this wonderful gratitude journey – working with gratitude to make deep-acting shifts in your life. I personally moderate this forum area, so you can get direct answers from me, as well as your peers on the programme, throughout the coming months – and beyond. This journal will take you through a year of writing about gratitude, on a daily basis, as well as inspiring you with uplifting quotations and unique gratitude exercises. You can keep it for yourself or gift it to someone you love. Plus there are a stack of pre-launch and post-grad bonuses that I’m keeping as a little surprise for you, once you’re in! 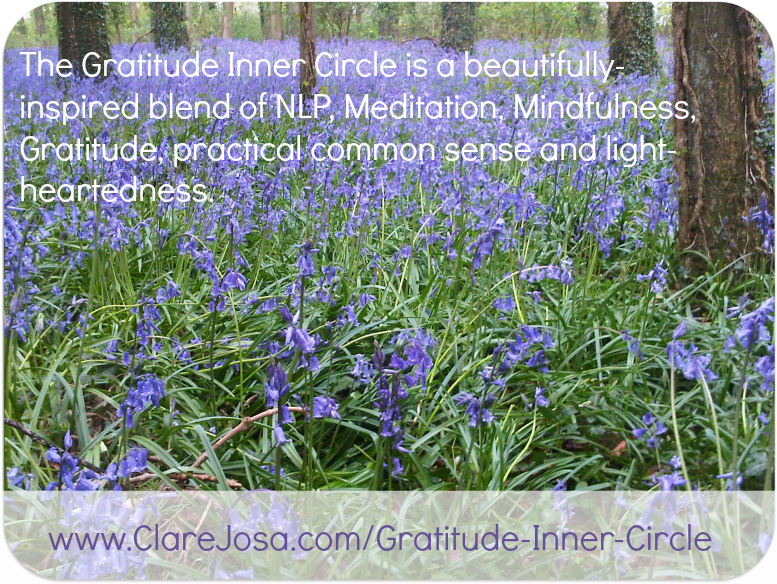 And, once you’re a Gratitude Inner Circle Grad, you’ll also get to repeat the programme, each time I run it, as my gift. Someone out there is waiting for you – for the unique gifts you bring to serve the world. The world is waiting for you to let your inner diamond shine. The content of this programme is unique and I have never shared it with a group before – it has been reserved for one-to-one mentoring clients in my spiritual growth programmes. I’m really excited about getting to share it with you. The time feels right for this. To go through this programme with me, one-to-one, would have cost you upwards of £5,000 and would have taken a year. However, I no longer have time to do this on a one-to-one basis. And it feels like the world is calling for this gratitude work to be much more widely available. The planet needs each and every one of us to be making the types of shifts that this Gratitude Inner Circle programme can create. So I’m offering it to you as a group mentoring programme, getting the same fantastic results, but at a fraction of the financial investment. 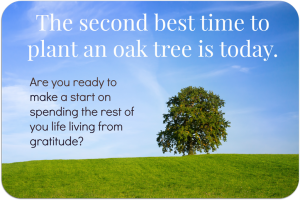 The standard investment to join in with the Gratitude Inner Circle is £497. That’s less than the cost of my entry level one-to-one mentoring programme. We’re still in the ‘pre-launch’ phase for this Inner Circle programme (which starts on 1st June 2014) and I’m not officially opening the doors until next week. But I was so excited that I decided to open registration a bit earlier than planned so that those who felt called to join in could dive in and get to know each other already. To thank you for jumping in and making a commitment to your future, and to give everyone a chance to join in at a price they can afford, I’m offering a crazy special offer to the next 10 people who register. The regular investment for this Inner Circle programme is £497 (approx $750 USD) – and it’s worth way more than that. I want to encourage you to dive in and say “Yes!” to your future – today. So the next 10 people who register can join us for just £147 (approx $222 USD). That’s a discount of £350 (over 70%). But it’s only for the next 10 people and, frankly, I expect those places to go today, after which you will have to sign up at the regular price. The sooner you make a commitment to the future you, the more you’ll save. This Inner Circle programme is only open to those who are prepared to make the commitment to themselves to dive in and make the most of the tools, techniques, resources, insider secrets and inspiration shared with Inner Circle members. If your heart is calling you to join in, register today to get started in the Inner Circle area of our private online community – and your group mentoring programme will start very soon. If your heart tells you by 30th June 2014 (that’s a whole month of trying it on for size) that this Inner Circle isn’t for you, then let us know by replying to one of the daily emails and we’ll give you a full no-quibble refund and no future payments will be taken. Could this be the most important choice you make this year? I can’t wait to share this exciting journey with you. Mankind is crying out for help. Those who have something to offer should come forward. Now is the time. P.S. Remember our Love It Guarantee? Not having enough time is the #1 excuse (sorry, truly legitimate reason!) I hear from people about why they can’t change their lives. Firstly, we tackle this, head-on, in the ‘Getting Started’ section and in the first module. Secondly, do you really think that the ‘future you’ on your 80th birthday will look back and say “Hell yeah! I’m so glad you didn’t bother changing your life because the ironing was so much more important!”??? I know that this stuff works – and I know it will work for you, if you simply go and use it! But I also know how it feels to start a programme and feel unsure or confused – and that’s ok.
It’s why I share with you that vital Truth I mentioned (back up the top of here), right before we get started with the main programme. And, if your heart genuinely tells you this isn’t a good fit for you, once we’ve started, then that’s why I offer my “Love It!” guarantee. 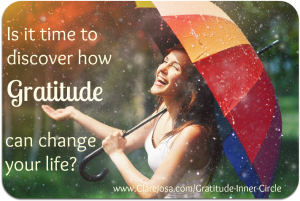 How does the Gratitude Inner Circle create lasting change? We don’t mess around with the sticky plaster stuff (Band Aids, I think, in the USA?). We dive right in and deal with the underlying causes. And it doesn’t have to hurt and it doesn’t have to be scary. I know that change can feel scary – believe me – I’ve been there. That’s one of the reasons why it is so important to me that I only share the depth of techniques we’ll be using in the Gratitude Inner Circle in a mentoring environment – and it’s why you’ll never find them just hanging around in a book. This stuff really works – and I want to make it as easy as possible for you – and that’s why it’s really important that we get to connect, rather than me leaving you on your own. We have the private online community, where you can share your experiences (both great and otherwise!) and get moral support, plus the fortnightly Q&As, where you can get answers to your questions. You are not alone. We are all there, walking this path by your side. And when that happens, change doesn’t feel anywhere near as scary, does it? Isn’t this stuff just a load of ‘woo woo’? My inner engineer chuckles over this one. She has lost count of the number of times she has thrown this question back at me. In fact, my original degree was a Masters in Mechanical Engineering and German and the first decade of my career was in senior engineering positions and then as Head of Market Research for an international brand – so I know about practical, strategic, insightful common sense solutions. And the vital Truth I mentioned earlier is the #1 reason why all of this will work for you, no matter what your cultural or social background or life experience so far. The 3 months (and beyond!) will feel different for everyone, but there are some common themes. Sometimes the module will be easy for you, because it’s just refining what you’re already doing. Other times it might be more of a challenge, as you let go of an old behaviour or release an old block and take on new habits. Comfort zones will get stretched. You will be re-training your mind – both the conscious ‘Monkey Mind’ and also your ‘unconscious mind’ – the bit that’s really running the show. Take all of this at your own speed. Dive in as deeply as you can – but know that the materials will still be there for you, if you want to repeat a module in the future to get even more from it. By the end of the 3 months, if you have worked through the modules, you will feel happier, calmer, more open-hearted, less stressed, more grounded and centred and life will flow more easily. How do the Q&A sessions work? These are held every two weeks and I’ll publish all of the dates and times before we start, so you can get them in your diary. They run at two different times – Monday evenings and Saturday late afternoons – alternating each call. This is to try to allow as many people as possible to join in live (given the wide range of time zones we’re all on!). The calls are all recorded and you’ll be able to download them from the members’ area, to listen to again. So don’t worry if you miss one! You can also submit a question in advance, if you can’t make the call, and I will do my best to answer it. All calls can be done via the phone (and there are a range of call options) or live via the internet (free) – so hopefully there’s a choice that will suit your schedule and call plan. I want to make it as easy as possible for you to really enjoy these sessions. No, of course you don’t! It’s entirely up to you! It really is worth the effort. I know what you mean 🙂 I hear this one quite often. It turns out that lots of us have got what I call ‘gratitude baggage’. Whatever the reason, the word ‘gratitude’ can rile some people. For others, one of its synonyms ‘appreciation’ works better – but for some people that’s an empty word. Some people prefer phrases like, “I love that… such-and-such happens.” There are so many choices – what is key is connecting with the feeling in your heart, rather than the word in your head. In the very first module we’ll be exploring what ‘gratitude’ really is and finding words that work for each of us, with our own personal life experience, and understanding how to make them work for you, triggering the emotions and physical feelings, when you work through the techniques.